Quick Thoughts: COMMUNITY, "Studies in Modern Movement"
"Studies in Modern Movement" was not the funniest episode of Community to date, but it had enough fun character moments to win me over. Plus, I was glad that it was a relatively normal outing even if it did have its trademark zaniness. I've gone on record that I'd watch a show just about Troy, Abed, and Annie, so the idea of having her move in with the boys has some promise. Sure, it's not going to be all fun and games, and I appreciated the fact that they addressed how Troy and Abed can be too silly while also having Annie stand up for herself. The sweet ending where they admitted that they needed her to ground them, and the shadow puppet theater were also nice touches and examples of moments that this show needs more of. Since Annie was moving, of course her friends were willing to chip in except for Jeff who pretended to be sick but was caught at the Gap by Dean Pelton which led to a pretty funny blackmail scenario that involve Mexican food and karaoke. I've never been a fan of the dean, so I cringed a little bit when I realized that there was going to be a plot just about him and Jeff, but I found myself laughing in spite of my reservations. The karaoke/music video sequence was the highlight of the episode, and it was fun watching Jeff loosen up a bit. It was also nice seeing him be a ladies man again since he's been wasting too much time in these silly "will they, won't they" stories with Annie and Britta. Speaking of Britta, the only story that I didn't care for from the get go was her's with Shirley as they once again argued about Shirley's faith and tendency to judge her friends. There were a few chuckle worthy moments, but it all felt stale because it seems like that's all these two talk about when they're around each other, and it doesn't help that Shirley has gotten zero character development and has become your typical annoying Christian cliché. Quick aside. Why did Dan Harmon feel the need to apologize to the gay community after "Advanced Gay" but not to the Christians, people of Middle Eastern descent, Asians, or any of the other groups that have been mocked by this show? Just something to think about. 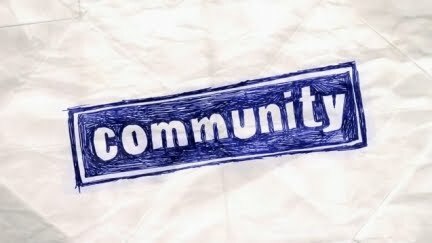 For at least one episode, Community pushed aside its need to be experimental, edgy, and arrogant to give us an episode with more heart than snark, and I for one enjoyed it more than I probably should have. "Studies in Modern Movement" still wasn't great, but it was decent enough and at least I didn't spend my time rolling my eyes.